Do you know the difference between Duckett's Dot and The Bridge? For years, the Dot stuck in people's memories but the Bridge was probably where most people thought the Dot was. This is a useful illustration technique used in Dr Lisa Lancaster's book, The Sound Hoof, for her explanation of Duckett's system. Sometimes I sit in the dark watching speaker’s slides at conferences and think like an Irish country matchmaker. I’d like to see her talk on the same program with him, or get this German together with this Australian, or whatever, and see what they come up with when a horse walks in to be evaluated. 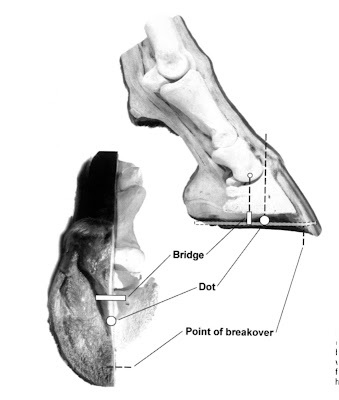 When I heard British educator Mark Caldwell roll through the results of his research that had compared different hoof balance methods over a shoeing period, I wondered if Dave Duckett knew that someone had put his “Dot” (and Bridge and all the rest of his landmarks) to the test not just of measurement, but of time. As it turned out, he didn’t know, but the news got his attention. Now it’s time for the two to present their versions of what hoof balance was, is or will be, side by side on the same program. It's a speaker-match made in hoofcare heaven. Two years later, the man with all the hoof balance testing tools and the man with all the ideas in his head instead of on paper will present their views on hoof shape and balance together, and perhaps re-define or update their studies, or influence each other. 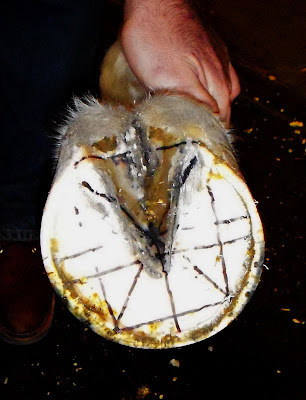 Consider this: is the best trimming method for a foot the method that leaves the foot looking balanced when the farrier drives away, or is it the one that prepares the hoof to grow out evenly and maintain a balanced base and flat landing over the four or six or eight week shoeing period? A foot map to where, exactly? This exercise included mapping out the foot as it existed at the time of trimming. Caldwell sketched in the wider base of frog that is one of his goals for this foot to show his students where the foot would be going, if it was trimmed not for the moment but for the continuum until the next farrier visit. If you're trying to help the horse develop the frog, would you trim differently than someone who thought this foot was acceptable as is? Should you map the foot the horse has or the foot the horse is capable of having? David Duckett FWCF: The well-known and highly honored British farrier and farrier competitor now lives in Pennsylvania. 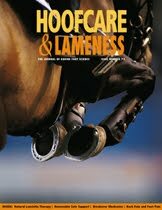 By my math, this year should be roughly the 25th anniversary of his first major hoof balance lectures. Based on observation and a lot of dissections and anatomy studies, Duckett’s idea was to get farriers interested in hoof anatomy by giving clever names to landmarks. His hoof balance system strives to inspire farriers to focus on the points on the horse’s foot least likely to change rather than to dwell on shapes that can and do migrate or grow unevenly. In spite of his system’s simplicity, or perhaps because of it, it is very often misunderstood and the points are transposed. Mark Caldwell FWCF instructs the farriery courses at Myerscough College in England. He trained as a farrier in the British Army and then became a specialist in shoeing horses for lameness problems at a veterinary hospital before turning to teaching. 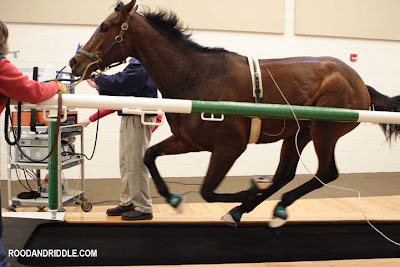 His research studies use gait analysis and weight-scanning mats; his quest is to define what he calls “evidence-based farriery”. Mark is currently involved in a post-graduate PhD program studying "limb loading and the effects on hoof capsule morphometrics" at the University of Liverpool Department of Veterinary Clinical Science in Liverpool, England. Together, these two speakers can explain where the ideas come from (Duckett) and what happens when you put the idea to a test that filters out the subjective tricks we play on ourselves when we evaluate horses’ feet (Caldwell). This clinic is a chance to hear “from the horses’ mouths” where in the world “Duckett’s Dot” came from…and perhaps where it is going in the future. In other words: this will not be a shoemaking clinic. This clinic most likely will be about looking at feet and identifying/evaluating the matrix that dictates a foot’s shape and growth pattern. The Clinic at Oakencroft’s Podiatry Conference is a casual and friendly event in a beautiful location in rural New York near the Massachusetts and Connecticut borders, just south of Albany. The Clinic hosts monthly meetings with local farriers and they feel at home there—you will, too. The format of the conference is presentations, discussions, and lots of great food. There are hotels nearby. The clinic fee is $300 for both days, $200 for Friday only or $150 for Saturday only. Registration should be complete by October 1st. Late registration will be at the discretion of the Clinic, as space allows. Registration can be done online, by mail, or by phone. If you have specific questions or wish to contact the clinic, you may call 518 767 2906 or send a fax to 518 767 3505. Ok, horse world, it's time to plan how and when you're going to take in the opportunities waiting for you in Lexington, Kentucky over the next few weeks. And the opportunities abound, with more events being announced each day. Whether you come for a day or a week, and whether you stay in a penthouse or pitch a tent, you'll never forget this. Think of it as Woodstock for the horse world. 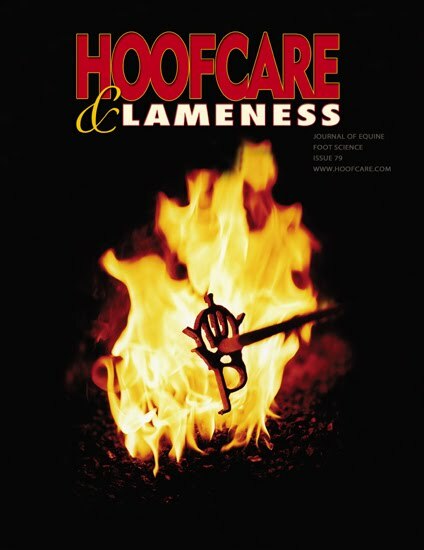 The World Equestrian Games, along with downtown Lexington's International Equestrian Festival, have a great lineup of both hoofcare and lameness related events coming up over the next three weeks. Both events have trade shows with horse health exhibits; there is a third horse expo in Georgetown, Kentucky (on the north side of the Kentucky Horse Park) as well (featuring legendary trainer John Lyons), and the wonderful Secretariat Festival on Saturday, October 2 in Paris, Kentucky sounds like fun. The education kicks off on Wednesday with the AAEP/Rood and Riddle/Alltech Veterinary Sport Horse Symposium . Familiar speakers from the Hoof Blog at the conference include Drs. Jean-Marie Denoix, Scott Morrison, Scott Pleasant, and Jeff Thomason among many others. Dr Simon Collins from Dr. Chris Pollitt's Australian Equine Laminitis Research Unit at the University of Queensland was a late cancellation. On Friday, the AAEP and Rood and Riddle will host A Winning Edge: Promoting Peak Performance in Equine Athletes with speakers like Dr. Hilary Clayton and farrier Rodney King on the roster of widely respected names. The Games begin on Saturday at the Kentucky Horse Park, with the opening ceremonies. The hoofcare education continues with daily lectures and demonstrations at Rood and Riddle's pavilion within the huge Alltech exhibition hall. 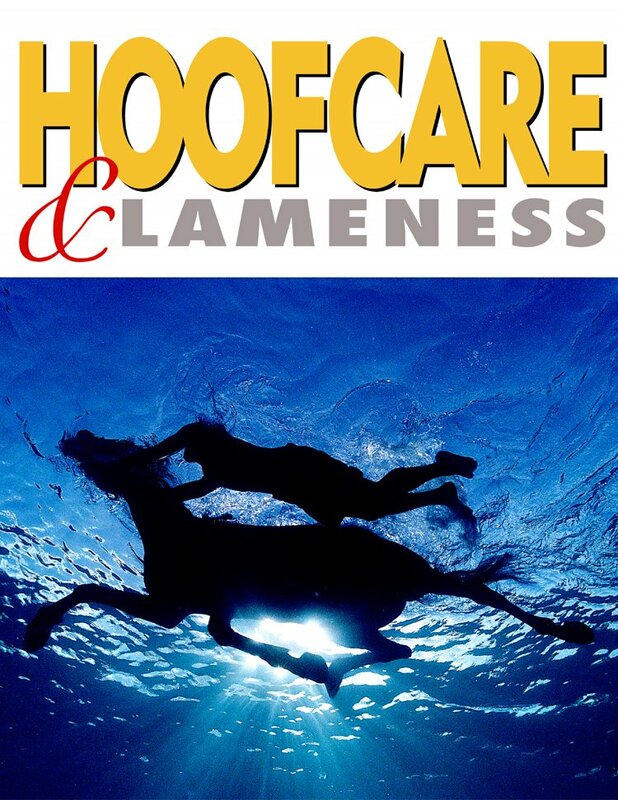 Farrier Michael DeLeonardo will be working on thermography imaging demonstrations for Equine IR, the company that is providing free scans for the competition horses. USA team farrier Steve Teichman is speaking at the Draper Equine Therapy booth, and the Horse Park's farrier shop has just received a decor upgrade, thanks to Farrier Product Distribution. In downtown Lexington at the International Equestrian Festival, hoofcare activities range from the Kentucky Horseshoeing School's live demonstrations to a six-lecture full seminar by Dr. Ric Redden and the heart-warming encore of Ada Gates Patton's Hoofcare@Saratoga presentation, "Debutante to Blacksmith". The American Farrier's Association has assembled a rotating able-bodied crew of volunteer farriers who are covering various phases of the Games. Watch for farrier chairman Thom Gabel and his crews to be both providing services to teams as needed in the barn area and to be standing by ringside during events in their "official farrier" capacity. And if they need administrative support, they won't have far to go, since their national headquarters office is located right in the Horse Park. Last but not least, Lexington opens its heart on Sunday night, October 3rd, for the premiere of the new Disney film, Secretariat, starring Diane Lane and John Malkovich. You can bet there will be plenty of Secretariat fans among the eventing spectators in Lexington that weekend. Ironically, the premiere will be the night before the anniversary of the day that Secretariat died, October 4th. 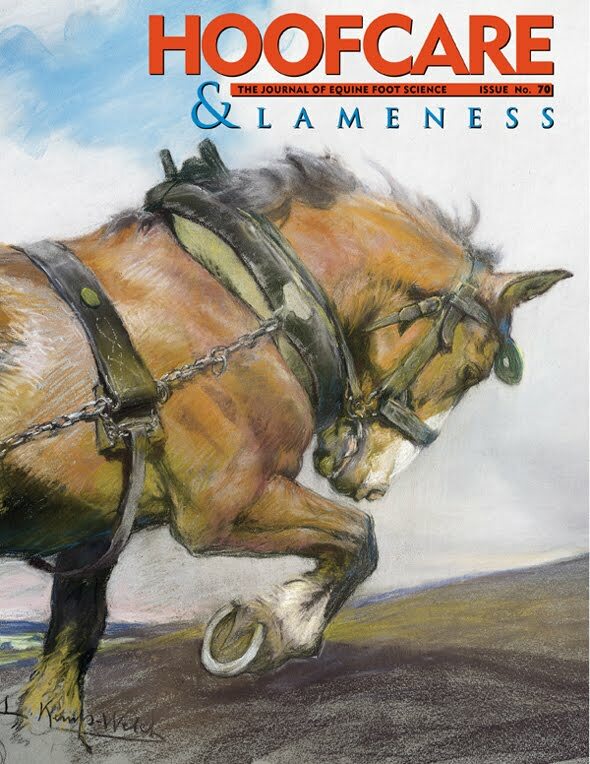 Surely this will bring to mind why Secretariat died--he had laminitis--and stimulate discussion about how progress is coming on preventing and treating and understanding one of world's most elusive, painful and frustrating diseases. Watch the Hoof Blog for lots of news and a full schedule about all these activities and many more as they approach. No matter what your interest in horses or hooves, the new few weeks in Lexington will be a feast for your senses and your mind. I hope to meet you while we're there! Send an email if you'd like to get together: blog (at) hoofcare.com. 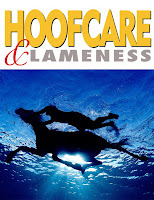 Follow the Blog's hoof-related Tweets from WEG on Twitter.com under @HoofcareJournal and general WEG Tweets under @FranJurga. The Alltech FEI World Equestrian Games haven't quite begun yet, but around the British stables, the farriers were hard at work this weekend. 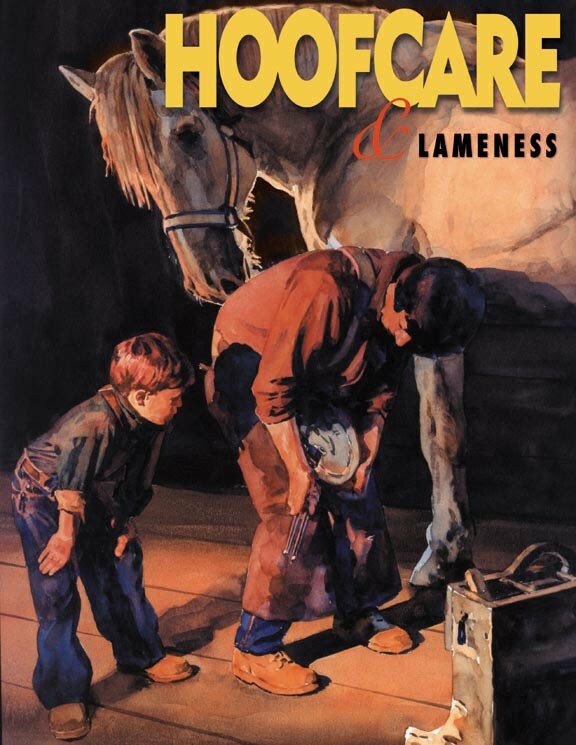 Except they weren't shoeing horses; there were no horses no shoe, as the European horses were still in quarantine at the Cincinnati Northern Kentucky International Airport 80 miles away. No, Haydn Price (team farrier for dressage and show jumping and lead farrier for the British "Equestrian World Class" Program) and Brendan Murray (team farrier for eventing) were pitching in just like everyone else in the British organization. They were laying stall mats, fluffing bedding, assembling wheelbarrows, and sweating in the Kentucky sun. Thanks to our colleague Samantha Clark of the 2010 Radio Show on Horse Radio Network, the Hoof Blog is able to share this video interview with Brendan and Haydn with you. It's probably a good thing--in a few days they'll be way too busy to stop and chat. 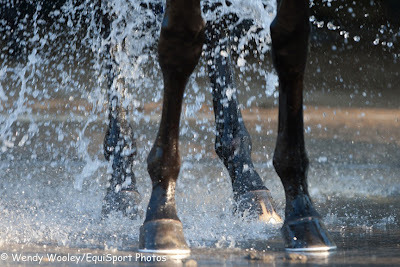 Leg Boots for Sport Horses: Protection? Support? Do They Work? How much do you know about protective and supportive leg boots for sport and performance horses? I don't mean just the difference between polo wraps and jumping boots, but how much do you really think they help prevent injuries to structures like the always-vulnerable suspensory ligament. Do you know the difference between protection and support? British equine science consultant David Marlin PhD is about to teach you a lot more in this lecture kindly videotaped and provided for us by the US Eventing Association. David's campaign to test horse gear the same way we test human gear makes a lot of sense and this video is a first step to understanding more about what some of the superficial leg injuries in eventing are like, where in the lower limb the horses tend to hit, how hard they tend to hit and whether a boot or wrap can make a difference. Sit down, relax, and take this in, or make some time later to come back and watch this. Please Tweet or email this page to others so that this information can spread. It may sound basic, but we find over and over again that it is the most basic things that people often do not understand because they seem so...well... basic, that they don't bother to ask questions. This is written by someone who has put boots on upside down plenty of times and been publicly embarrassed for it! I will certainly suggest to David that if there are to be rules about boots that marking "top" and "inside" should be mandatory. Thanks again to US Eventing and to Dr. Marlin for providing this excellent lecture. I think if I could just keep this YouTube video on a continuous loop and keep watching it, I'd have no problems keeping stress at bay. There is something very relaxing about watching these Thoroughbreds stretch across the black-and-white frame of this film, as the lovely music plays. It's not real, of course. This is a sort of "greatest hits" reel of slow-motion galloping horses from a series of Japan Racing Association (JRA) commercials; someone has kindly edited the slo-mo galloping sequences together for us. I'm quite often asked for slo-mo galloping clips that do not have distracting backgrounds so for all of you who have asked, here you go. I see footage like this and can only hope that Disney did as well when shooting Secretariat (which will be out a month from now, as a matter of fact). The original JRA commercial was quite nice and it dovetails with the melancholy I feel each September when Saratoga is over and the Breeders Cup isn't really here yet. Thank goodness for the World Equestrian Games this year. I've always been a fan of the rousing instrumental musical equestrian commercial genre made famous and perfected by Rolex, but I think the JRA has done something very special here. It's a commercial that conveys a reverence for horse racing and horses. Indulge yourself by watching the gallopers as many times as you please. I know some of you will be able to use these horses in your teaching. Be sure to thank the JRA the next time you see a representative at a conference. They do wonderful things. PS As a post script, I am really happy to see that this article has been near the top of the most popular posts on this blog for the past month or so. I'm not the only one who likes it! Or, someone is watching it over and over and over again! Thanks again to the JRA. Rood and Riddle Equine Hospital in Lexington will make technologically advanced diagnostic and treatment equipment and personnel available to any horses that may become sick or injured during their stay in Kentucky. This horse is being worked up on the Rood and Riddle high-speed treadmill so that his metabolism and airways can be evaluated. Many of the people who read this blog would be just as happy being backstage at the 2010 Alltech FEI World Equestrian Games in Lexington this fall as they would be with front row seats. Of course we all hope that no horses are injured or become sick during the Games but if that happens...the vet bases backstage are very well-covered. In fact, if you do the math, there may well end up being more veterinarians than horses at the World Equestrian Games! Rood and Riddle Equine Hospital is only six miles from WEG. To explain, here are some insights to Rood and Riddle Equine Hospital's role as the Official Equine Hospital and Veterinary Partner for the Games. Rood and Riddle is, of course, one of the leading equine veterinary medical centers in the United States and the world, and its location in Lexington is serendipitous to insuring the finest possible care for any veterinary needs that arise for horses at the Games. 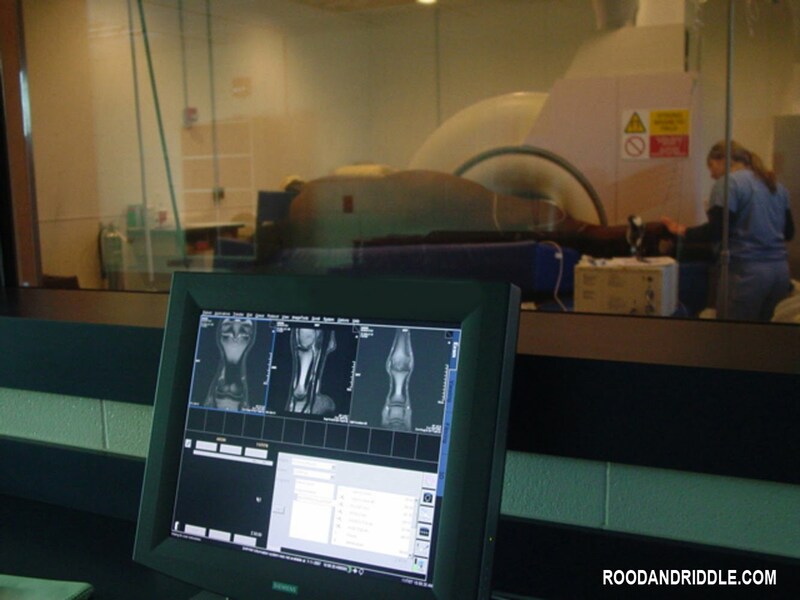 Rood and Riddle's college-campus style setting accommodates horses of all breeds for referral surgery, medical treatments, diagnostic imaging and a very special service, equine podiatry. Rood and Riddle Equine Hospital employs 50 veterinarians and 200 support staff. Four of the veterinarians are specialists in hoof problems and three farriers are employed in the podiatry clinic and technicians have specialized skills in hoof-related procedures. Interns and trainees can change the number of people working in the podiatry department on a given day. During the World Equestrian Games, Rood and Riddle will work closely with Dr. Kent Allen, the official veterinary coordinator of the Games. Dr. Chris Newton, a veterinarian and partner at Rood and Riddle who is also an avid equestrian and eventing competitor, heads the Rood and Riddle team of veterinarians and veterinary technicians assembled to provide medical support to the Games. When the horses arrive in Kentucky from all over the world, their handlers will pay close attention to how well they survived the stress of travel and are settling in to their new surroundings. However, these horsemen and their equine charges will have access to one of the most extensive arrays of advanced veterinary services available at a competition. The Horse Park will offer an on-site veterinary clinic that will provide 24-hour care ranging from basic medical treatment to high-level diagnostics. Rood and Riddle Equine Hospital, less than six miles away, will be staffed and ready to address any emergency or injury in need of specialized medical care. The diagnosis of musculoskeletal injuries is a specialty at Rood and Riddle. Experts in equine imaging have precise criteria for selecting between MRI, CT, nuclear scintigraphy, ultrasound and digital radiography for the best evaluation of an injury, depending on whether a soft tissue or bone may be injured. This photo shot through the observation window into the MRI suite shows an anesthetized horse with a limb inside the MRI magnet. The monitor in the foreground shows preview images. During the Games, a minimum of six Rood and Riddle veterinarians with numerous veterinary technician assistants will be on-site daily. During the more taxing competitions, such as Eventing Cross-Country, Endurance, and the Driving Marathon, the veterinary staff will increase with additional support from the Rood and Riddle medicine and surgery specialists at the on-site veterinary clinic. In addition to the Rood and Riddle veterinarians, every National Federation will send a minimum of one team veterinarian. The Fédération Équestre Internationale (FEI), the governing body of equestrian sport, will also have veterinarians in attendance. The FEI veterinarians’ primary function is to ensure that all rules are being followed, allowable medications are administered correctly and the horse’s welfare is placed above the competition. One of the most exciting aspects of the Alltech FEI World Equestrian Games for Rood and Riddle is the opportunity to educate the world about the hospital and the advances in equine veterinary medicine. WEG attendees will find the Rood and Riddle Pavilion, located within the Alltech Experience compound, to be a must-see destination on their tour of the extensive exhibit areas at the Kentucky Horse Park. The pavilion (design plan at right) will provide an educational experience for young and old with multiple interactive stations and video displays covering the latest veterinary technology including diagnostic imaging, equine medicine and surgery, and stem cell therapy. Visitors can use touch screen controls to choose which type of horse they would like to see on a treadmill followed by the endoscopic view of the throat, use an ultrasound probe on a phantom uterus to locate a pregnancy, and see an actual surgery table anesthesia machine set up complete with a 900-lb. model of an equine patient in position and ready for surgery. The pavilion also includes a theater section where daily lectures will be presented by Rood and Riddle veterinarians and other equine professionals including Hall of Fame jockeys and World Games competitors. Rood and Riddle is also hosting tours at the hospital, Monday through Friday, at 10am and 12pm during the Games. Tours are by reservation only and may be booked at www.HorseCapitalTours.com. Tickets are $12.95 per person (ticket required for children aged 5 and up; strollers not permitted) with $5 from every ticket purchase going to the Kentucky Equine Humane Center and the Kentucky Horse Park Foundation. After years of planning and anticipation for the big event, our friends at Rood and Riddle are ready and say that they are honored to participate in this extraordinary event. They're eager to see World Champions crowned in eight disciplines. Let the Games begin! If you enjoyed this story, or if you are planning to attend the World Equestrian Games, you may also want to read Fran Jurga's new blog, Discover WEG with Fran Jurga on the discoverhorses.com web site. It will only be around for a few months--the Games will soon be here! 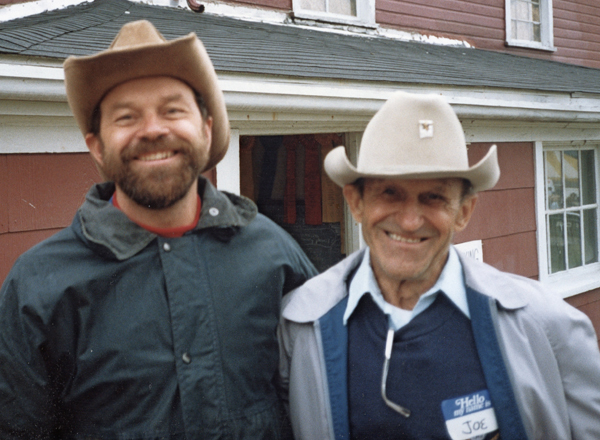 Joe Kriz may have the most famous smile in American horseshoeing. He was the star of Capewell nail ads and the grin showed up everywhere. So did Joe. The media loved him. Even beyond the Kriz family's association with the Budweiser Clydesdales and other big name shoeing accounts, Joe was paydirt for the media. Cameras loved him. Joe Kriz Sr. of Bethany, Connecticut died in his sleep yesterday morning. I just got back to town and found out and the news hasn't really sunk in yet. 1. I went looking for these photos of Joe in my files and I believe I have more photos of Joe Kriz Sr. than of any other single person. And in every single photo, he's smiling. Grinning. Ear to ear. And he has a cowboy hat on, too. 2. When I started on this crazy idea of specializing in writing about hoofcare, I knew I had to do one thing: make a pilgrimage. I knew exactly where to go. I drove to Bethany, Connecticut and spent a Sunday with Joe Kriz and his brother, Johnny, in their forge with my tape recorder going. If I was starting tomorrow and knew what I know now, I would do the exact same thing all over again. It was an auspicious beginning. Services for Joe, known as "UJ" to many, include calling hours Friday night (a little hurricane would never slow down Joe Kriz) from 4:00 to 8:00 PM at the Ralph E. Hull Funeral Home in Seymour, Connecticut (north of New Haven). A funeral will be held on Saturday, September 4, at 10 a.m. at Christ Episcopal Church, 526 Amity Road, Bethany, Connecticut. You can see an amazing collection of photos from Joe's equally amazing life here. If anyone is keeping score, I believe Joe was 93 years old, or thereabouts. He was born in 1917 to a long line of Czech farriers going back eight or more generations. 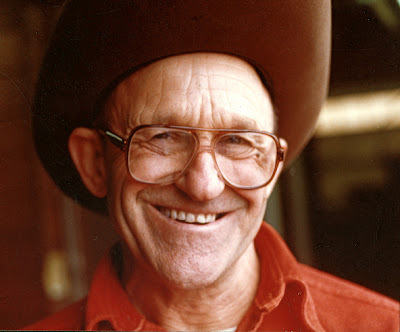 If you have no idea who Joe Kriz is or why this grinning face would belong to the man whom many consider the most famous horseshoer in the 20th century in the United States, you could read this fantastic article about him that was in the Draft Horse Journal last year. Even if you do know who Joe is, you'll enjoy reading it. This is by far the best article I have ever read about him. When you read it, you will see that Joe Kriz pretty much had the 20th century of horseshoeing and horses, for that matter, in the USA covered. He had the horse world on a string, and he worked it. Joe shod horses well into his mid-80s, when his health forced him to stop. He kept shoeing not because he had to, but because that is what he did in life, and what he wanted to do. In other words, Joe Kriz had a lot to grin about. Sad as I am, I can't help but grin through my tears just thinking of him. Joe Kriz Jr and Joe Kriz Sr.: two generations of American horseshoers from a family dynasty stretching back to Europe. 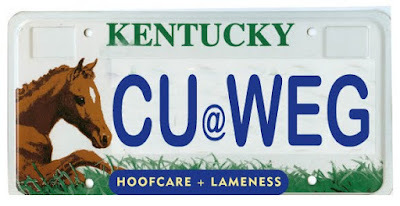 My friend Wendy Uzelac must have been thinking of The Hoof Blog when she was walking around Keeneland Racetrack in Lexington, Kentucky yesterday. Her expert camera clicked just as the groom threw a bucket of suds at the lower legs of the horse that many believe is the top older male horse in the USA. Blame has been on a roll this year and beat Quality Road last month in the Whitney at Saratoga. The New Yorkers must be relieved that Blame is back in Kentucky. Quality Road and Mine That Bird have a pretty local field in this weekend's Woodward. Thanks to Wendy, who specializes in photographing Thoroughbred racing and golf, for aiming at Blame's leg's instead of his handsome head and congratulations! She's getting married to fellow photographer Matt Wooley this weekend and will move from northern Michigan to Lexington, where Matt is based. The Thoroughbred industry in Lexington is in for a treat. Image © Wendy Wooley/EquiSport Photos.